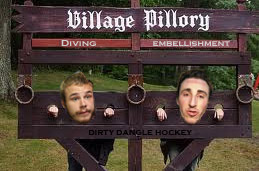 Dirty Dangle Hockey: Shame The Divers! Last week there was a little "Rules Summit" going on between players, officials and team execs to address the officiating standards in the NHL. Not surprisingly, diving and embellishment was one of the main discussion points during the summit, and a pretty good idea emerged out of it - the proposal to create a list of divers in the league. 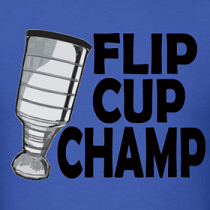 This list would be posted in all 30 NHL dressing rooms and be delivered to referees before games. The list would take divers and embellishers public for shaming in front of their peers and in theory work as a deterrent for those on the list to stay on their feet. While there are obviously a few wrinkles to be dealt with such as criteria to get you on this list, who decides who's on the list, and what you can do to get off it, we love the idea of publicly shaming divers as the current rules of supplementary discipline in the form of a suspension/fine just aren't cutting it. The list ensures embarrassment and we have a few ideas of how the NHL and players could take this a step further. As part of the NHL's All-Star Fan Festival, you can throw old vegetables and balls of clear hockey tape at members of the "Diving List" who will be locked in their for the ultimate public shaming. 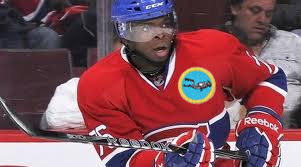 Give Them A "Badge of Shame"
Lot's of kids in minor hockey have stop signs sewn on the back of their jerseys, these guys should have scuba diving badges as a stigma for their poor gamesmanship. They will not only be punished, but serve as a deterrent for other players. They have just about every type of highlight package on their website so why not put the top dives up there as well? That's one highlight reel you don't want to make. 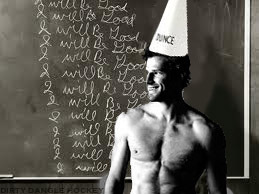 A member of the Diving List will have to give all their interviews in the corner of the room while wearing a Dunce Cap to show what asses they are for diving and embellishing. While he won't suspend you, he will make a video to announce you've been added to the list. "As you can see, the player did not come into any contact with the opposing player and made a reckless attempt at embellishing a tripping call. For their actions, I am adding them to the Diving List." Often these players who embellish look like they've been shot by a sniper up in the rafters, so why not make it look like they are actually be followed by a sniper. 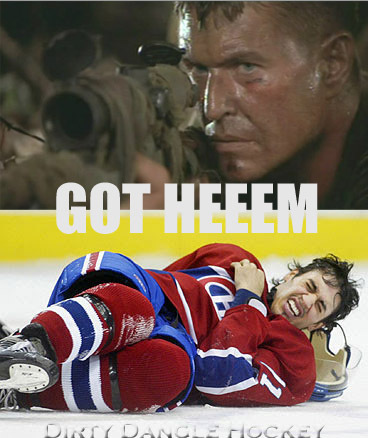 Really it's just an excuse to have "Tom Berenger Night" at the arena. Is there going to be hockey this year?